It is very important to be able to sail well in world of pirates, as if you are sailing to slow, enemy ships will try to destroy your fleet and you could end up on a raft. 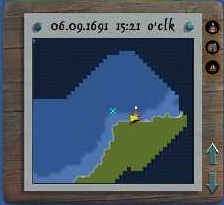 When you are sailing around you can use the mini map in top right corner of your screen to help find your way, here you can see what you uncovered of the map. You can see yourself as a light blue x in the mini map. You can add or remove coordination in the mini map with F2 or what key you selected for it in options. On the right side of the mini map, you can turn off/on way points, city flags and enemies. If you use the arrows on the right side, you can zoom out or in. If you zoom out (arrow up) it will be easier to find new cities around the map, as the city flag will turn up on the map before you get near it, when you get closer you will discover the city. The mini map is mainly like the map in the right click menu here. The only difference between the mini map and map is that you cannot change way points on the mini map. 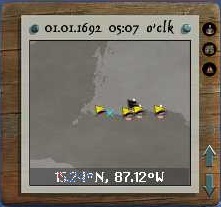 Wind direction and strength is shown in the top left corner of your screen on the windrose. In the picture below it shows full wind strength which will give you maximum speed if it comes from the right direction, compared to the direction you are sailing. 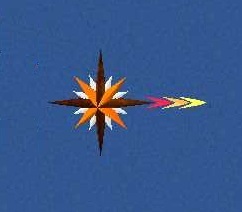 If only a red and orange arrow is on your windrose then it is normal wind strength and you will not sail as fast, as you can with full wind. If only a red arrow on then you have low wind strength, you will have even less speed. In the status bar you can see your speed in knots (kn) beside it you have a speed help light, if you are in deep water (dark water) sailing at maximum speed it will be light green, and will turn more grey if you (slow down) sail in a bad wind direction. Speed help will turn red, when you are in shallow water (light water) as here the wind does not affect your speed. How to sail against the wind. If you are sailing in deep water against the wind, you can easy lose speed. Maintaining good speed against wind takes a lot of practice. At ship class one to three it take time to lose speed as the wind direction for maximum speed can come from two directions. At ship class four to nine, you will see that the higher ship class you sail with against the wind, the slower your fleet loses speed. If direct into the wind you can use half sails to maintain speed longer. When you start to lose speed you can do an s like move, where you turn to get good wind, to gain speed and then turn back into the wind. Ship classes one to four, which turn fast, can more easily do this. Here are some of the things you can do to gain better speed. Do not sail mixed fleets, when you put different ship classes in your fleet, you will lose speed. Hire the mate specialist, to help you gain a speed bonus of maximum 1,8 and a minimum speed of maximum 4,8. Learn all about specialists here. Repair your fleet, when in a city with a shipyard big enough to repair your fleet. Just one damage ship in your fleet, can slow your whole fleet down. You can also repair at sea, if you have the specialists called carpenters and you have wood and cloth onboard, to repair at sea. Learn about specialists here. You can upgrade your ships to gain more speed, most players try adding the maximum speed upgrades possible to ships they build in shipyard. Learn about ship classes and building ships here. You can also buy special store ships, they stay 100% condition unless shoot and some have more speed, then the ships you can build in shipyard. You can find them in the store here.